With live events you only get one opportunity to successfully produce the show– so thorough planning is essential. As event designers/stagers we now have new pre-visualization software tools that bring this process a sophistication that would not have been possible just a few years ago. With the click of a button, LD Assistant can show your rendering from multiple angles, which are key to helping the technical team successfully execute the design. To ensure proper execution the PSAV team designs event renderings in LD Assistant, a 3-D computer-aided design (CAD) program (sometimes in combination with similar CAD programs), that are 100% to scale so that event planners know exactly what to expect with the help of detailed on-screen pre-visualizations– and just as important, our technicians know the precise measurements and layout of the arrangement well before arriving on site to set up the event. We begin the design process with the discovery phase by acquiring every bit of information we can from our salesperson that secured the event. First and foremost, the PSAV team learns the location of the event, finds the dimensions of the room and determines if the number of expected guests can actually fit in the venue. If they can’t, it’s back to square one. If the audience does fit the room size, we next determine if the amount of desired AV equipment can fit into the venue. If little has been decided regarding the design, we will ask what AV is available on-site to save money and will go from there to create a design. Again, if the technology is too large for the room, a loading dock isn’t available or the equipment can’t fit into the freight elevator, we need to devise a different plan. PSAV then considers if the design specifications align with other key concerns, such as not blocking fire exits, spacing tables enough for people to sit at them and pass behind chairs, is the seating arrangement conducive to the type of event (seated meal, presentation, etc. ), how well every seat can view the stage and screens, what part of the room best accommodates the stage, can the venue handle the power required, etc. We try to consider every obscure issue in advance to avoid any future design issues or potential hazards. This is one of the many renderings Kevin Denzel presented in Washington, D.C. at the New Bay Media/ InfoComm Rental & Staging Roadshow. In his presentation, Denzel explains his design process and the capabilities of LD Assistant. With the design in mind, PSAV then turns to LD Assistant, or similar CAD program, to create a digital rendering. If I do not already have the room rendered in LD Assistant, I will create a plain, gray “box” to the precise dimensions of the room. Then I’ll create a quick mock-up to send to the salesperson to ensure I have a clear understanding of the client’s vision. If necessary, I’ll make any requested changes, and once approved, apply the design details to win the client’s business. To begin, the gray “box” is transformed into a detailed design of the actual room. Sometimes this step is accelerated if we are able to acquire a CAD drawing of the room. Otherwise, if geographically feasible, we go to the venue and use standard and laser-disto measures to determine the dimensions of every wall, every door, every window, every light fixture, every column, etc. If our Magnum, P.I. skills are working, sometimes we can get the high-res Photoshop file of the renderings the interior designer used for the carpet, wallpaper, etc. Otherwise, we photograph the carpet and tile it to realistically portray these elements. Building a true-to-life room exactly to scale in LD Assistant can sometimes take weeks. After completing the venue rendering, next we move onto the audiovisuals. The needs of every event vary so much from one to the next, that where to begin depends on the event. 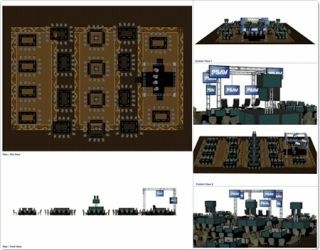 For example, if the event requires a special seating style, PSAV would start there. Eventually, all seating and audiovisuals are added with precise detail. The stage, all screens, etc. should be created to their exact dimensions, and “light” should be added to show the exact throw of the projectors. LD Assistant provides thousands of 2-D and 3-D-model representations of light fixtures with accurate attributes for each light, including color mixing, pan/tilt and weight. Quantity counts or weights can be done in a few clicks. Make sure you’ve thoroughly analyzed the design because meeting planners’ first concern is always if the design will fit. Secondly, you need to wow the client by adding meticulous detail — show the beam of light shining onto the podium, add nuts and bolts to where beams connect and account for global illumination and ambient occlusion. LD Assistant allows you to use photometric (light energy) values to create more lifelike representations of light disbursement. The more detail that is added, the more realistic it will look and the greater your “wow” factor for your client. Be sure to consider the delivery to your client too. In this digital age, you are no longer bound by static renderings. LD Assistant allows you to create video walk-throughs of your design in which you can actually add animated people and video running on the screens. LD Assistant provides the ability to create authentic .DWG files, which will translate seamlessly to other programs and across the board with AutoDesk software products. As you create your rendering, also be sure to consider your other client: the technicians who will execute the event. More than aesthetic details, they care about the accuracy and preciseness of your rendering. When detailing rigging, consider the lowest point of the ceiling; plan for the proper throw distances of projectors; account for AV drape lines and screen lines; and plan for potential obstacles, such as chandeliers. One of the advantages to using LD Assistant is its built-in database for producing equipment lists; changes made to your 2-D plan will automatically be reflected in your 3-D model and in the schedule. The schedule can be as detailed as you want it to be; PSAV takes the opportunity to actually assign inventory numbers. LD Assistant’s schedule feature allows you to gather crucial data, such as the quantities of different equipment; assign prices; and show light fixture circuitry information, DMX channels, gel colors and other attributes, such as what the intention is for the light. The schedules can then be exported for easy reference for your crew. “Measure. Measure. Measure.” All this preparation will be for naught if your measurements are incorrect. The entire audiovisual team is depending on you for an accurate design, and I’m proud to admit that I’ve had a 100 percent success rate the past three years running. Finally, be sure to export multiple images of your design from various angles. LD Assistant allows you to easily provide a range of views, including 2-D, isometric 3-D, fully-textured or wireframe diagrams, elevation and aerial from any angle. Depending on the design, providing these different angles to the AV team can be crucial to proper and safe execution. While our LD Assistant renderings can be valuable to winning a client’s business and providing the plans to our technicians, we can’t stress enough what a collaborative effort the whole process is. Be sure to get the event specifications from the salesperson, design for the client’s meeting objectives and plan for the needs of your team.